The purpose of foosball roll pins are to go through the rod and hold the foosball men and handle in place. Roll pins are a great way to hold the men and handles tight on the rod without coming loose and will rarely break. All high-end tables today use the roll pin method to hold the men and foosball handles because they are lightweight and won't slow down the rod. Other lower-end tables use bolts which can slip loose over time and actually slow down your rod movement and shot speed. The pin punch is just a tool that allows you to install the roll pins without breaking the foosball men or warping your rod. To begin, you simply align a roll pin with the hole in the rod. Next, place your pin punch on top of the roll pin and lightly hammer the pin punch. Sometimes your roll pin can slip and become misaligned with the pin hole so don't keep hammering the pin punch if you feel resistance. You may need to stop and realign the roll pin with the pin hole in the rod. 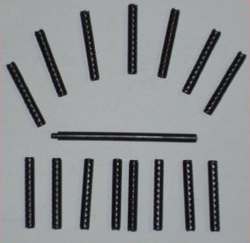 Replacement roll pins and pin punches can be purchased together in a package of 15 pins and 1 pin punch. They can also sometimes be purchased as individual pieces if you just broke 1 off in the middle of your man and need to replace it. The packages of 15 typically go for around $14 US and each piece can be found for about $1 each.